He played drums for Kitty Wells and Charlie Louvin, Jeannie Seely and Jack Greene, and Mel Tillis and Dottie West over his long career, but he will forever be known as one of the backbones of one of the most beloved bands in Nashville, the Western swing-inspired supergroup The Time Jumpers, and one of the friendliest musicians you would ever meet. 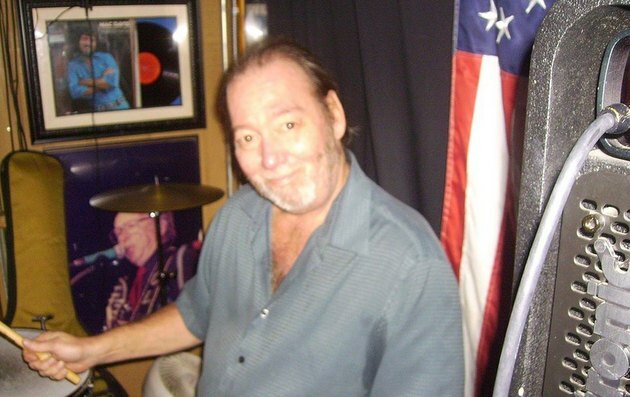 Richard “Rick” Vanaugh, long-time drummer for The Time Jumpers, and a studio and touring musician, has passed away. Rick recently received a terminal diagnosis for liver disease, and was only given months to live. And estimated 400 friends and family of the drummer had gathered on May 22nd at The Nashville Palace for a benefit for Rick, and the event included performances and appearances by notable Nashville names. Rick Vanaugh was born on August 3rd, 1954, and was originally from Youngstown, Ohio. It is said Rick was so passionate about country music, he immediately pursued a career after finishing high school, moving to Nashville and getting his start behind Charlie Louvin. This would lead to a string of high-profile gigs behind numerous country music Hall of Famers, and multiple television appearances on TNN shows such as Church Street Station and New Country. Vanaugh joined Lorrie Morgan’s band in 1989, and played on her 1991 record Something in Red, and spent half a decade playing for the country star. He also played on Vince Gill’s 2011 record The Guitar Slinger. Later in life though, Vanaugh’s claim to fame would become his steady hand behind The Time Jumpers. Joining in 1998 to take the place of Kenny Malone when the band landed a regular gig at The Station Inn, Rick Vanaugh became a staple of the supergroup of studio musicians and notable Nashville artists, including Vince Gill, fiddle player Kenny Sears, and steel guitar player Paul Franklin. Over 20 musicians can claim to be a part of The Time Jumpers at one point, not to mention all of the famous guest musicians, but Rick was one of the few constants in the lineup and played on both the band’s records—their debut in 2007, and 2012’s self-titled release. Yes, and the year isn’t even half over yet.